Which came first: The obese chicken or its obese microbiota? « Nothing in Biology Makes Sense! Which came first: The obese chicken or its obese microbiota? Historically, medical research has focused on pathogenic bacteria when trying to understand the relationship between human health and microorganisms. This makes intuitive sense – since pathogens make us sick – but our bodies host way more nonpathogenic bacteria than pathogens and they function in keeping us healthy. Our gastrointestinal tract has trillions of bacteria in it and much recent work has been trying to understand these complex communities. Mice are a common model for understanding human gut microbes and health. Enter Obie, the obese mouse (Figure 1, left) and Lenny, the lean mouse (right). Obie and Lenny are genetically different at a locus in their genomes that codes for leptin – a hormone that inhibits appetite. Mice that can’t make this hormone become very hungry and morbidly obese. These two mice also differ in the composition of their gut microbiota – obese individuals (both mice and human) have different amounts of the main bacterial phyla in their gut and as a result, are able to more efficiently extract calories from food. In other words, if you give both of them the exact same amount of food, Obie is going to get more calories from it than Lenny, contributing to Obie’s weight problem. In humans, where the status of our “leptin locus” is not normally known and probably not as straightforward as the case of Obie and Lenny– it’s been hard to tell whether this shift in gut microbiota is the CAUSE of obesity or the EFFECT of obesity. That brings me to today’s paper: a short communication in The ISME Journal (that’s open access!) by Fei and Zhao that addresses this exact problem. Fei and Zhao use a series of complicated molecular techniques (that I don’t fully understand) to show several cool things. First, they followed obese individuals (and their gut microbiota) through highly controlled diet and weight reduction. The predominant bacteria in the obese state was Enterobacter, which became undetectable by the end of the 23 week trial. They hypothesized that Enterobacter might be causing obesity so they isolated a single strain from the genus (called B29), grew it up in pure culture and attempted to confirm Koch’s Postulates – basically the gold standard for showing that a bacterium is responsible for a disease. They’d already fulfilled the first one: that the bacterium must be isolated from a sick host and grown in culture. Next, they did a series of experiments to see if they could induce the disease (obesity) in healthy individuals inoculated with B29. Figure 2: Fei and Zhao isolated an Enterobacter strain, B29, from an obese human. They grew it in culture then inoculated 2 germ-free mice (while using 2 other germ-free mice as controls). 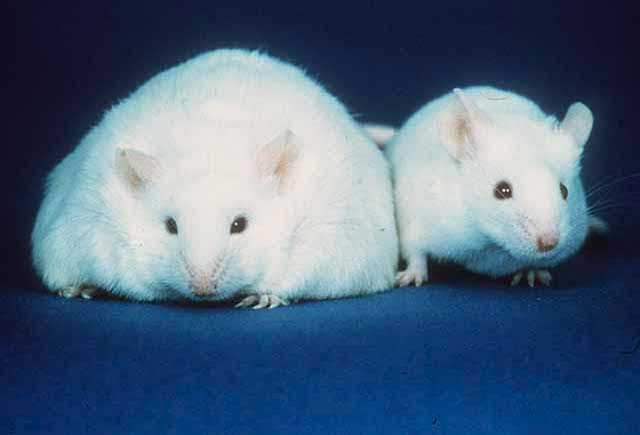 They found only the B29 mice fed a high-fat diet became obese. Turns out, the bacterium alone was not enough to cause obesity – the bacterium had to be coupled with a high-fat diet. Mice that were inoculated with B29 and fed a normal mouse diet did not become obese. 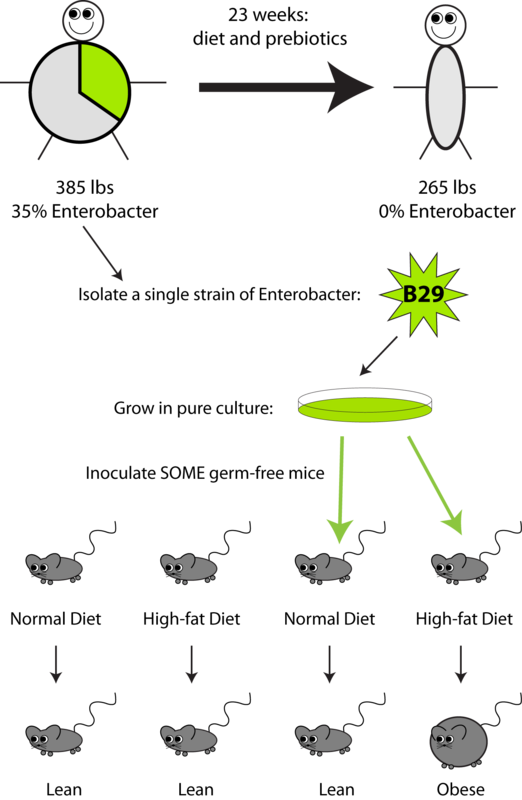 Neither did control mice given a high-fat diet in the absence of B29 nor mice on low-fat diet without B29 (Figure 2). The B29 (plus diet) CAUSED the disease (obesity)! Another of Koch’s postulates. Fei and Zhao have used the germ-free mouse model and (slightly modified) Koch’s Postulates to show that a single human-derived bacterium can CAUSE obesity. Seems kinda simple but I think that’s actually a pretty big deal: a single bacterial species can cause obesity. This opens up a lot of medicinal and therapeutic possibilities! They can also repeat their protocol to isolate further bacteria possibly causing this disease – and potentially others – in humans. So which came first: the obese chicken or its obese microbiota? Neither. The scientists came first then told us all that bacteria may indeed precede obesity. This entry was posted in diet, genetics, medicine, microbiology and tagged B29, germ-free mice, gut microbiota. I love love love the mouse picture! We are covering bacteria and archaea in Intro Bio labs this week and I am definitely going to have my students read this entry. This is exactly the kind of result that is predicted by Lynn Margulis’s theories on symbionts. One can only hope that she finally starts to get the credit she is due for persevering in the face of indifference and hostility from other biologists. More and more similar results are coming to light now which suggest very intimate and vital relationships with bacterial symbionts. We are in fact communities of bacteria – some tightly bound in cells, and some loosely bound in our gut and elsewhere. Gnotobiotic studies have their limitations despite that they are a logical progression from in vitro studies and isolate otherwise complex immune and intestinal interactions. Gnotobiotic animals typically have immune systems and intestinal walls that are under-developed. Also, all the food must be antigen free, which is difficult to achieve. Often, secondary infections can rapidly kill off an entire gnotobiotic colony or mask effects of controlled dietary variables. In our experience with gnotobiotic pigs (which are more relevant to human nutrition and gut microflora), administered probiotics had no effect on morbidity when challenged by a single-strain pathogen, whereas pigs in conventional state (non-gnotobiotic conditions) fared significantly better. Animals in a germ-free environment do not fully represent their counterparts in a conventional environment ,and variables in studies with gnotobiotic animals must be strictly controlled (and are very expensive). I found it interesting that in neither the paper or the supplementary information was provided the specific ingredients of the ‘WTP’ diet except for the major nutrient composition. ‘Chinese medicinal medicine’? ‘Prebiotics’? As a reviewer, I would have requested this information be more specific. When reading the first paragraph I was already thinking that there is no way the “leptin locus” in humans can cause obesity just by itself. Eating cheeseburgers and drinking soda plays a huge role in obesity but bacterium doesn’t. However as long as you have a high fat diet along with a high amount of bacterium it will lead to obesity.